If you are in need of an Apex Home Inspector we can serve all of your home inspection needs. 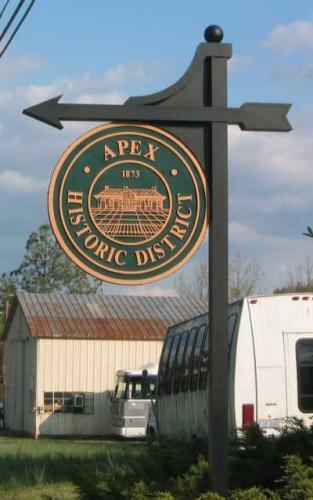 A brief history on the town of Apex: The town of Apex was incorporated in 1873, named for its location as the highest point on a portion of the Chatham Railroad which ultimately extends between Richmond, Virginia and Jacksonville, Florida. Apex grew slowly through the succeeding decades, despite several devastating fires, including a June 12, 1911 fire which destroyed most of the downtown business district. The town center was rebuilt and stands to this day, now one of the most intact railroad towns in the state. At the heart of town stands the Apex Union Depot, originally a passenger station for the Seaboard Air Line Railroad and later home to the locally-supported Apex Community Library. The depot now houses the Apex Chamber of Commerce. Apex suffered mild setbacks during the Depression-era, but growth began again in earnest in the 1950s. The town's position in proximity to North Carolina's Research Triangle Park spurred additional residential development, yet the town managed to preserve its small-town character. During the 1990s, the town's population quadrupled to over 20,000, placing new demands upon Apex's infrastructure. Apex has continued to grow in recent years. A sizable shopping center was built at the intersection of Highway 55 and US 64, and several new neighborhoods have been built as the town grows toward the west. In July 2009, CNN/Money magazine ranked Apex #44th on its list of the nation's top places to live. Despite the setbacks, Apex has continued to be one of the best places to live in North Carolina. We provide home inspections in Apex and the surrounding areas.